The popularity of scientific computing environments such as Mathematica, Maple, and Matlab has increased considerably over the past decade because of the fact that scientists and engineers feel more productive in such environments. One obvious reason is the powerful toolbox and the simple syntax of the command languages in these environments. Another factor is tight integration of visualization which would allow you to quickly visualize what you have computed. However, one downside of the environment is that they do not work well with other types of numerical software and visualization systems. This is where Python comes in. Python offers a simple and clean syntax of the popular computing environments including Matlab. So which one is better – Python or Matlab? There is no simple answer to this question because they both have their fair share of pros and cons. Python is a general-purpose cross platform programming language which is particularly easy to learn and the code is clear to read and write. It is a very expressive language that requires writing only a fewer lines of code that what would be required for an equivalent application written in C++ or Java, for that matter. Python is written in portable ANSI C, so it compiles and runs on all viable operating systems including Linux, BSD, Mac OS X, and Palm OS. Its core language and libraries run the same way on all platforms, so you can program in mixed environments. Simply put, you can use Python interfaces to your existing libraries as a way of creating your own problem solving environment. Matlab stands for Matrix Laboratory and is a powerful technical language for mathematical programming. It is a mathematical and graphical software package with many built-in tools for solving problems and developing graphical illustrations. It was developed by Cleve Moler in the late 1970s. It started as interfacing software for an easy access to the Fortran libraries for numerical computing without writing Fortran. The professional version of Matlab with graphical and GUI features was developed in 1983 jointly by John Little, Cleve Moler, and Steve Bangert. They then started rewriting Matlab in C which led to the formation of MathWorks in 1984. Since then, Matlab has become the de facto standard for data analysis, graphical visualization, numerical analysis, and several other applications. – By definition, Python is a multiparadigm, general-purpose programming language written in portable ANSI C and used to develop fully fledged applications or other software tools. Python’s core language and libraries run the same way on all platforms, so you can program in mixed environments. Matlab, on the other hand, is a commercial math and matrix oriented language for mathematical programming. Matlab has specialized toolboxes that are professionally developed and meticulously tested for several scientific and engineering applications. Matlab has more comprehensive numerical functionality than Python. – Python comes with an extensive standard library which allows you to do thing such as create a web server, download a file, unpack a compressed archive, and more, with just a few lines of code. The library aimed at general purpose programming and contains modules for operating system specific stuff such as threading, networking, databases, etc. 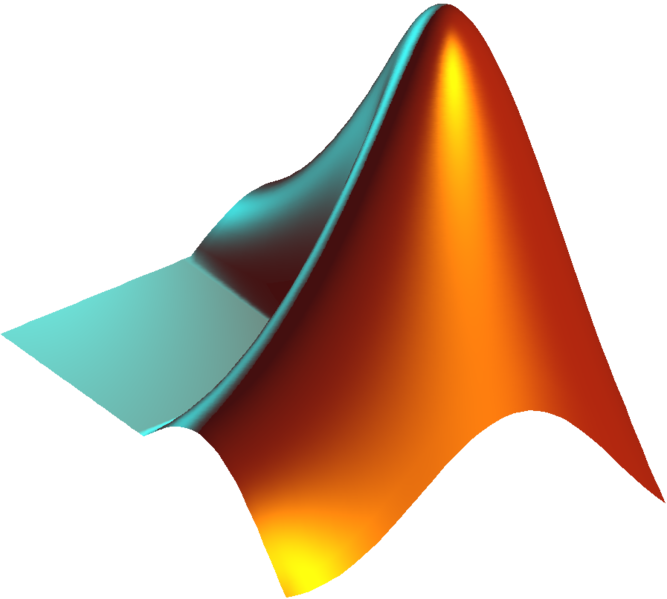 The standard library of Matlab, on the other hand, does not contain as much functionality for general purpose programming but it does have several powerful toolboxes to solve most common problems. – Python and Matlab have many things in common including simple and clean syntax, no declaration of variables, easy creation of GUIs, and gluing of visualization and simulation. However, Python clearly has an edge over Matlab in terms of developing environment. Python environment is completely open and made for integration with external tools, whereas Matlab is an interactive mathematical program used for numerical analysis, graphical visualization, signal processing, and many other applications. Matlab is platform-independent which means the program can run invariably on all platforms. – Python uses 0-based indexing meaning the arrays are indexed from 0 to provide consistency with other family of languages including C, C++, and Java. The 0-based indexing means the first item is at index 0, rather than 1, and the second item is at index 1, and so on. However, arrays can also be indexed using negative numbers which makes algorithms simpler in form. Matlab, on the other hand, uses 1-based indexing like most vectors and matrices which simply means it has indexing of arrays starting from 1 instead of 0. – Python is more expressive and readable compared to Matlab, when it comes to large scale problems and Python’s libraries are more sophisticated for writing utility programs and CGI scripts. However, graphical capabilities of Matlab are more convenient than that of Python’s because its graphics relies on external packages that must be installed separately. Python code requires developer-oriented add-ons to get improved performance benefits such as explicit parallel programming and just-in-time compilation. However, Matlab is weak as a general purpose programming language. Both Python and Matlab are high-level programming languages used to execute several data analysis and rendering tasks for both science and engineering. They have indeed many things in common, including no declaration of variables, simple and clean syntax, easy GUIs creation, and gluing of visualization. However, Matlab is a programming language and computing environment for scientists and engineers alike, whereas Python is a general-purpose programming language used for web and app development. Python is more expressive and readable compared to Matlab, when it comes to large scale problems whereas graphical capabilities of Matlab are more convenient than Python’s. Sagar Khillar. "Difference Between Python and Matlab." DifferenceBetween.net. 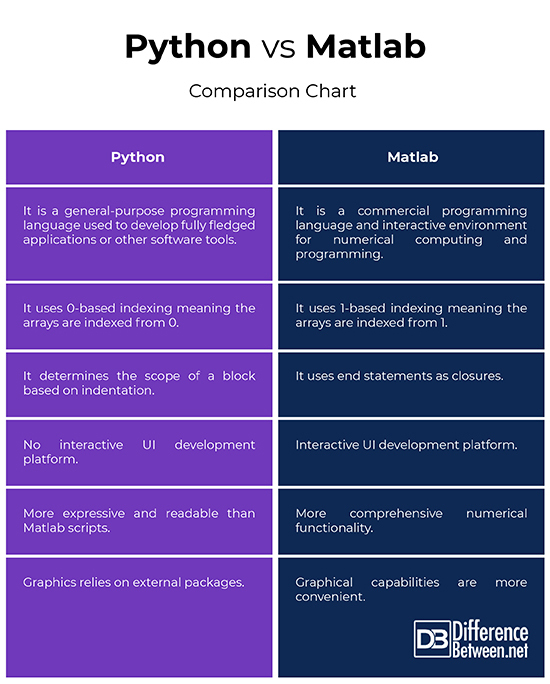 March 5, 2019 < http://www.differencebetween.net/technology/internet/difference-between-python-and-matlab/ >.